I'm in the process of putting together a data collector for my O-235 in my Long EZ... I've got the 8 thermocouples set up and working via a KTA259k shield and a Sparkfun SAMD21 Mini board. I'll end up building a board with 8 MAX31855's in the near future for faster data. I'm also reading Manifold press, Timing and RPM from a Lightspeed ignition and Oil press and Temp from the installed engine sensors. 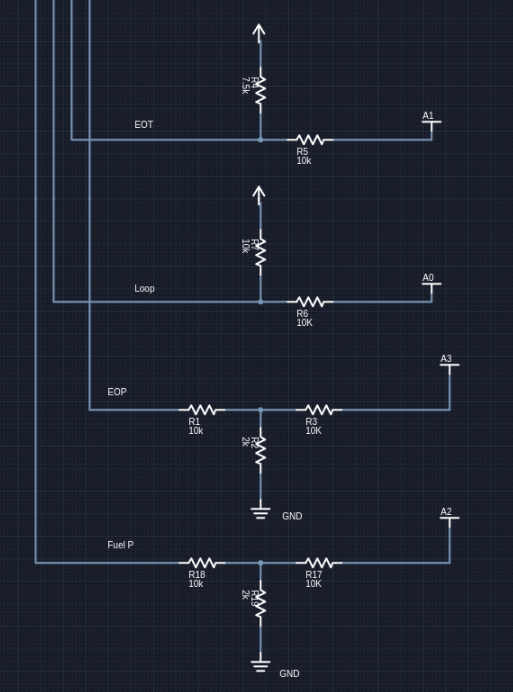 Loop is a continuity loop - the other side of the circuit has a 10k resistor to ground... If the loop is open, the circuit will go high. If the loop is shorted, it'll go low, and if all is normal, it'll hover about in the middle. I'm just looking for a quick review of the circuits to make sure I'm close before I start burning fingertips. For the MP and timing, I'm thinking a 2Hz filter in hardware. The RPM is a 15ms 10V pulse - 2 per rev (with a zener for protection and a little filtering to clean up noise). The oil pressure is a 5 volt sensor (5->3.3v divider with zener protection) and the Oil Temp is a low resistance sensor from a Westach oil pressure gauge. I understand that a 220Ohm resistor is about right with these. The Arduino is a 3.3v flavor. Why not do your 2Hz filtering in software? choose appropriate value of e to achieve the smoothing you want according to how often the loop cycles. My only thought was that the hardware filtering will clean up noise that will get into the software filtering. It also slows down the requirements for data collection for the filter... I can sample the Oil press a couple of times a second and have good data. Or, am I over thinking this? Both digital and analog filtering (and digital sampling) are all *huge* topics with libraries of textbooks devoted to them. So whether you’re overthinking this depends on what kind of results you want, I suppose. You might want to ask yourself how noisy do you expect your oil pressure sensor to be? Where’s the noise coming from? What kind of spectrum does the noise have? What does the real signal under the noise look like? If you want filtering it does help to know what it is you’re trying to filter out and what you’re trying to keep. Software filtering is easy to adjust, and your Arduino is likely to be sitting in a loop doing nothing for almost all of its processor cycles, so you’ve plenty of processing resource: it probably doesn’t cost you more to sample at 5Hz, or 10Hz. > Why not do your 2Hz filtering in software? > choose appropriate value of e to achieve the smoothing you want according to how often the loop cycles. were gathered and processed at 1Hz or slower. interpret, display and analyze the data? Dedicated application, EXCEL, etc. etc? and marry to his software. Use any of this as it suits your purposes. configured for a range of sample rates . . .
5 and 25v full scale. battery supply . . . or ship's bus. data interwoven with data of interest. Are you deeply committed to the 3.3v Vdd product? the 5.0 vs. 3.3 decision. The original intent was basic data collection for looking at performance, cooling, drag reduction, etc... It's evolved a bit to be a full engine monitoring system - with display. I'm seeing how easy a 2.8" (or two) displays are easy and fast to drive. First goal is displaying the data as an engine monitor, and second will be collecting for model improvement and tracking drag reduction. A long goal is to be able to develop a system that can effectively back out a pilots performance handbook based on a few flight profiles flown during their first 40 hours on a new experimental. I'm looking for relatively clean data for presentment on the display initially. This first pass will be a few boards soldered up and mounted - functional for a few months while I work on the cockpit display, etc... Then, PCBA's built (and shared if there is other interest in this system...) I'll be writing more as I progress. My mechanical and aerodynamics prowess is much better than my electronics... But I'm learning. � and marry to his software. � Use any of this as it suits your purposes. � adapted as needs present. � configured for a range of sample rates . . .
� 5 and 25v full scale. � battery supply . . . or ship's bus. � data interwoven with data of interest. � Are you deeply committed to the 3.3v Vdd product? � the 5.0 vs. 3.3 decision. What's the reason for using a degree-K sensor, instead of a degree-F sensor (like the LM34)? you need a source of negative voltage to bias it up. Ah, yes. I suspected that; I didn't notice the negative supply requirement for sub-zero on the LM34 until after I hit 'send'. 0-5v input range for DAS isn't insulted either. soldered to the end of a single, shielded conductor. Great call on the LM235 degree K sensor... I'll be using that on the front module for the air data computer side of this thing. Can't the ground for an LM35 just be biased up a volt or so to get the negative temperatures if the voltage conversion accounts for that 1 volt? I spent some time looking over the DAS system... Nice setup - thank you for the education seeing how these are really designed... 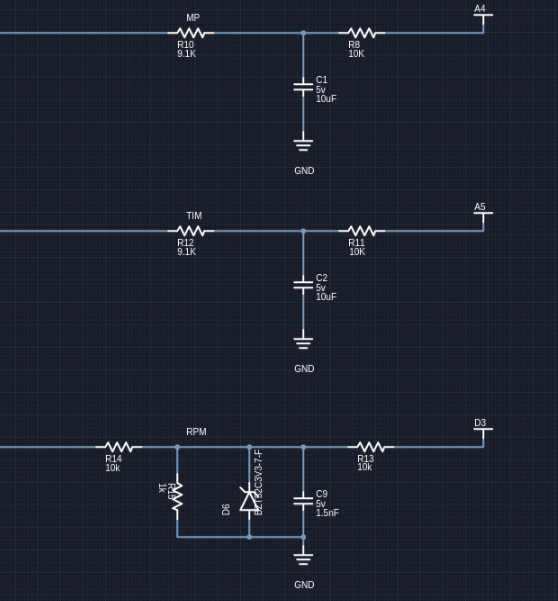 I've got a EE degree from 20 years ago, but never got into circuit design. Always a development guy... Sensors and mechanical integration of the electronics, along with calibration and engine tuning. 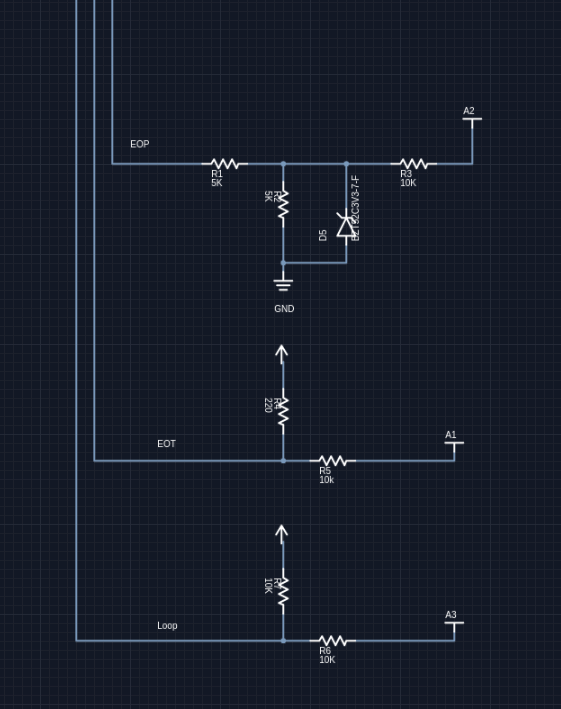 Now I'm getting into some fun circuit design and trying to relearn. Failure analysis... It won't be anything more mission critical than oil pressure... I can hear RPM... Everything else is bonus data from where I am today. As far as failure of this system affecting the rest of the airplane - pull the breaker and shut it down. Probably not exceeding physiological perception latency... I'm gonna have to remember that one. My CGR30P's in the other airplane record at 3Hz. Data gathered will be written to SD card... Probably won't store more than 10 hours of data, Estimating 3-5 MB an hour so pretty easy on GB class SD cards. Analyzing data... I do this with my CGR30's and dump it either into Excel or process it with a chunk of C code to grab what I need and get what I'm trying to learn that day / week / month / airplane. I already display the MP and Timing on a 3.5 digit panel meter - want to get rid of that. Filters pretty smooth. Planning on light filtering in HW to clean things up and help the AD's out, then use SW filtering to get where I need to be. Both are really cheap and good in their own ways. Getting closer on the circuits via my re-education in electronics... Open for any other thoughts or improvements... Anything I'm doing grossly wrong, or could easily improve. Planning on setting the ARef to 1.1V on the Ardunio. 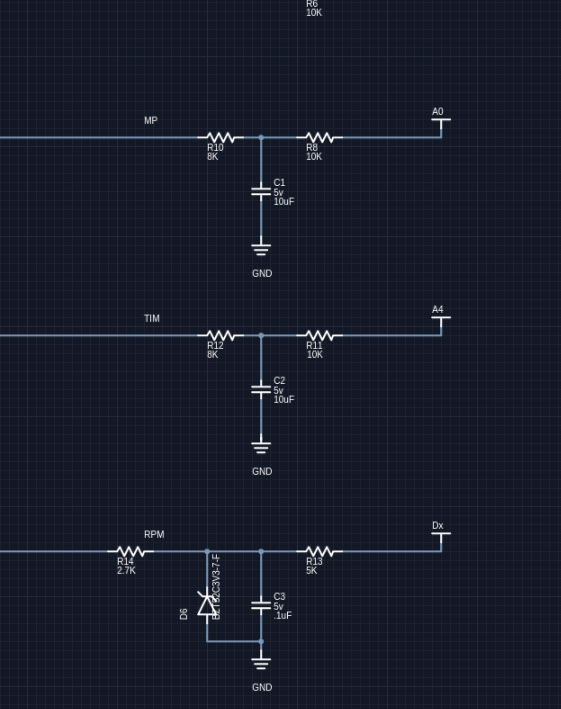 I think I have my voltage dividers and filters about right. I have the 10V, 1.5ms RPM signal coming in - I think the circuit I've put together will work for the digital Arduino input - interrupt SW works, but I haven't tested this circuit against it. Fuel Press and Oil Temp are the Westach 387-100 KV and 387-30 KV 0.5V to 4.5V sensors. EOT is a Westach sensor as well 2190 ohms at 90F (about as low as I need to measure) and 212 ohms at 212F. How can I improve the resolution at high temp without giving up the range at the bottom end?